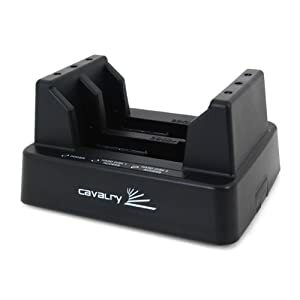 Cavalry EN-CAHDD2B-D USB Dual-Bay Dock Works with Higher Capacity Hard Drives! The Cavalry CAHDD Series USB Dual-Bay Dock With RAID Feature EN-CAHDD2B-D is a real gem. It operates in RAID levels 0, 0+1, and 1, Spanning or JBOD mode. The spanning feature is the most important to me, because it allows me to consolidate two smaller drives into one big one. The Cavalry EN-CAHDD2B-D USB HDD Dock is somewhat dated; to a time where the largest SATA hard drive size is 2TB. So the specification indicates that the maximum hard drive size it can handle is 2TB, which allows it to span two of them as a 4TB drive. Today, hard drive size has increased. 3TB and 4TB hard drives are common. 5TB hard drives are the cutting edge. After getting a brand new Seagate Expansion 4TB Desktop External Hard Drive USB 3.0 (STBV4000100), we have decided to pull the internal hard drive out to test it with the Cavalry USB HDD dock. We have a old 500 GB drive to test with it. We inserted both drives into the Cavalry USB dock and turned the dock on. Windows 7 recognized the 4.5TB drive in Disk Management. We were able to initialize it to either MBR or GPT. In MBR format, the drive was converted to two separate partitions (MBR can't handle one large one). GPT allowed us to to use the entire 4.5TB spanned drive as one partition. The Cavalry EN-CAHDD2B-D USB Dual-Bay Dock is a great value even with today's large drive. It seems that it can handled two 4TB drives for a combined 8TB spanned drive. Question, now, is whether it will handle 5TB in the upcoming years. Excerpt: Cavalry CAHDD Series USB Dual-Bay Dock With RAID Feature EN-CAHDD2B-D for $19.99 with free Super Saver shipping. - Two-bay dock for easy consolidation of storage - Supports (2) 2.5? HDD or (2) 3.5? HDD - Supports up to 4TB using (2) 2TB SATA drives - Supports RAID levels 0, 0+1, and 1, Spanning and . . .